The street lights are lit, roads have been black-topped, side-walks paved. Kathmandu is getting a much-needed cosmetic facelift. The government is even shutting down schools and offices for two days. The importance of next week’s SAARC summit for post-conflict Nepal, and the possibilities it will open for its recuperating economy can’t be overstated. The two-day jamboree will see leaders of eight member nations and nine international observer delegations, including United States, China, European Union, Australia, Japan, South Korea and Iran. In the recent years, the regional body has earned a reputation for being a talk shop. Past SAARC Summits have also been eclipsed by tensions between India and Pakistan. But the 18th SAARC summit is expected to change all that, paving the way for closer cooperation between members and fostering regional integration. The agenda includes the longstanding goal of connecting South Asia, allowing citizens of SAARC nations to travel to other member countries by land, waiving visa fee for SAARC citizens and regional Power Trade Agreement (PTA) to facilitate energy trade among member states. All this will boost growth, bringing peace and stability to the region through economic and social integration. However, the Nepal government and the Kathmandu media are treating the occasion more as a Indo-Nepal Summit. The media obsession with Modi’s visit to Hindu and Buddhist shrines in Muktinath and Lumbini, where he is scheduled to deliver addresses and distribute bicycles to students, has the government nervous. 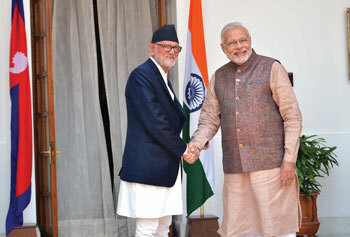 Modi’s last visit to Nepal was historic in terms of improving bilateral cooperation on many issues, including energy. But these were deals between two sovereign governments guaranteeing mutual benefits, Nepal does not need to bend over backwards in appreciation. To understand Modi’s love for public diplomacy, one must look back at his recent past. Here is a person, who was feared, if not hated in India until a year back for his divisive politics. But thanks to the unpopularity of his political opponents, and astute media management, Narendra Modi managed to clean up his image and win the election with a landslide. Today, despite communal clashes under his government, Modi has been able to bewitch national and international media with his magic mantra of ‘bikas and bhaichara’ (development and fraternity). So, while the Muslims in parts of Delhi are prevented from celebrating their festival by BJP leaders, non-resident Indians from the same community rapturously welcomed Modi in Australia earlier this month. Such is the power of ‘Modi Mania’, even the world’s most powerful nation which once compared him to Hitler and imposed a travel ban, rolled out the red carpet in October. To be fair to Modi, he seems to be making a genuine effort to transform not just his image but his politics as well. This was most evident during his election campaign in Faizabad, near Ayodhya where he miffed the radical RSS and his mentor Mohan Bhagwat by deliberately refraining from making any mention of the disputed Ram Temple. He invited Pakistani Prime Minister Nawaz Sharif to his swear-in ceremony during a period of strained relations, patiently mended Indo-China ties while the Chinese were clashing with Indian forces at the border. Modi has reached out to his neighborhood. In Nepal, he disappointed ultra-Hindu nationalists by refraining from any mention of Hindu religion during his parliamentary address in August. Narendra Modi is sure to grab all the attention of the Nepali and international media next week, but if he really wants to go beyond image makeover and project himself as a regional leader, he must take the responsibility of playing a pivotal role in bringing peace and political stability in South Asia. This will not just make him popular back home, but earn him support and leadership of one-fifth of world population. The communalism virus from across the border is poisoning the tarai.